I believe Isreal completed the hook up of our ceiling exhaust fan. He had a vent to roof kit. So, the "tube" is attached to the fan and now exits out the roof. I'm not exactly sure how it looks and I couldn't get a picture (because I am not climbing on the roof no matter how much you beg for it) so you'll just have to imagine. Phil came by for about an hour to go over our placement for the sink/vanity, the mirror/medicine cabinet, and the light fixture. After a bunch of measuring and discussion it was decided that for everything to fit (and look pretty) the best thing will be to take back our original one piece over mirror light fixture. We'll need to find 2 sconce type fixtures to put on either side of the mirror instead. The angle of our ceiling just doesn't give us enough height for the products we bought. So... looks like we're in for another Home Depot trip. Yippee! (Read that as sarcastically as possible. Home Depot... not my favorite shopping spot.) But, everything is all decided and planned... so that's a relief. It does also mean another visit by the electrician though. Thank goodness they were a reliable and quick bunch of guys. Hopefully they can get them in here tomorrow. 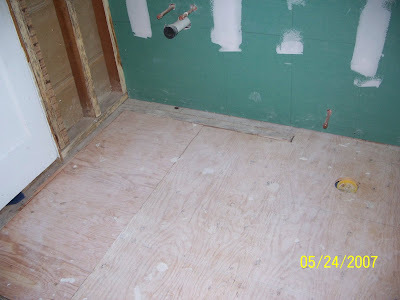 Since the sink set-up was all decided Isreal also began work on making the place for the medicine cabinet to be recessed. He cut out one stud and set the cross bars. 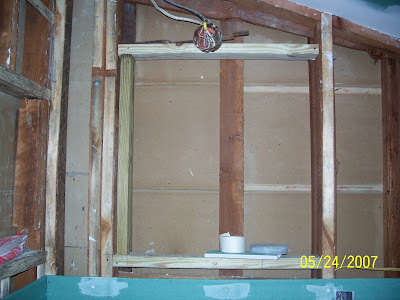 You can also (barely) see at the bottom left of the picture, a bit more sheet rock is in. 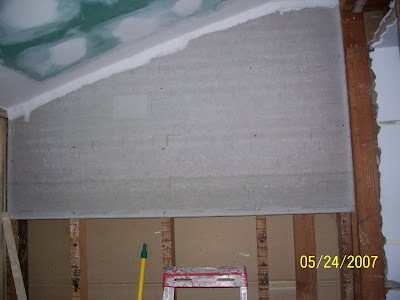 He also got tired of waiting for the plumbers and decided to start working from the ceiling down with the cement board. This is the wall behind our tub. Isreal really is pretty amazing at getting those angled cuts right the first time. Just perfect! And finally, before he left for the day... Isreal asked me for a broom and dust pan. The swept plywood floor was a nice surprise. I was figuring we might just sneak in there and clean up a bit of dust... but he beat us to it! I've been a bit lazy about checking into the office about the plumbers since Isreal seems to be keeping tabs on that whole issue... but I'm going to put a call in first thing tomorrow morning. With the holiday on Monday, I figure I better see if I can do anything to assure they'll get the plumber here. It's just really going beyond ridiculous. In any other type of work if you were a no show this many times you'd be fired, especially after having been fired once and then given another chance. I don't know how plumbers like this stay in business.